While Pope Benedict XVI didn't make it to Shreveport we've still got Alan Dyson and his new Church stickers. Dyson is host of the Fairfield Studios House Concert Series and a musician. He's also father of talented Shreveport singer Alana Dyson (it's a talented pod of people as Trudeau explains in this 2005 blog post of his. If RRBJ ever secures a pot of money for documentaries can't think of better place to begin recording than with them...). He's married to Shreveport artist Debbie Buchanan Engle. Shreveport architect and multi talented artist Dyson may not be the pontiff or any other type of official spiritual leader but his message is thoughtful. 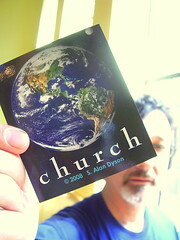 If we view the whole world as Church won't we take better care of it, ourselves and our neighbors? Who was it who said "Love thy neighbor..." Shoot him an email at salandyson@comcast.net on how to get one of these nifty stickers.